The book of Psalms gives us glimpses into God’s character and his love for us. Though some people view God, as portrayed in the Old Testament, as angry and vengeful, a more careful read gives us a different perspective. 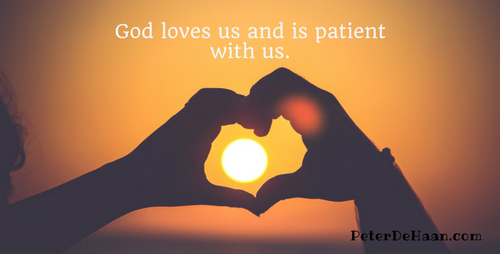 We see his love and his patience; he is slow to anger. We realize his desire to enjoy community with us. One such example of God’s character comes through with poetic elegance in Psalm 30:5. Here we read that God’s “anger lasts only for a moment.” Even better is what comes next, that God’s “favor lasts a lifetime.” And now for the poetry part: “Weeping may stay for the night, but rejoicing comes in the morning” (Psalm 30:5, NIV). Nine times the Old Testament reminds us that God is “slow to anger.” This occurs three times in Psalms and twice in the Law of Moses, along with Nehemiah, Joel, Jonah, and Nahum. That’s a lot of people reminding us that God is slow to anger. If we view God as a good parent (recall that God is our father, and we are his children), we realize that there will be times of needed correction. But if we respond appropriately, our time of discipline will be short. Then we emerge from it and return to right relationship with God, experiencing his favor and his love, just as every good parent wants for their children. So, too, God wants this for us. God is slow to anger, but his favor lasts a lifetime. Praise God!